My older son, Duncan, participated in this program during the late Spring of 2014 as a "extension" of sorts to his first hockey season. Essentially a drills session where the kids are broken up into groups based on ability and then spend nearly an hour going around cones and things. Held on Friday evenings just before a public skate session, there was usually one apparent "coach" and a couple of helpers along too. Defintely a fair ratio. Based on ability, Duncan should have been in the middle group but, as these things often go, height plays a role as well. At four years old, he was doomed to the third group. The lower group had numerous 'players', a term I use loosely, that couldn't skate at all making it a colossal waste of time for the children that could skate as they were put through drills well below their ability and then stood in line waiting for other children to finish. While I'm 100% in favor of getting all kids out on the ice, I also wish these types of programs would enforce their prerequisites. And, to that end, I also wish parents could evaluate the ability of their own children realistically. Really, that's the root of the problem. While the skating drills were valid, my son spent much of his time waiting in line watching what the other two groups were doing but was never given the chance to "move up". Running the third group was a teenage girl doing the best she could with what she had. No fault of her own and I think that had she not been forced to take on the role of "Learn to Skate Instructor", Duncan would have learned a lot from her. 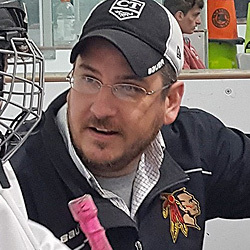 It's a recurring issue that I've noticed in youth hockey -- where a "coach" focuses 100% of his attention on the best players and 0% on everyone else. If you're not elite, you're garbage. While I have little doubt that there's much satisfaction to be had coaching skilled players, it's not a good long term strategy. So, while the main coach put the best (and his preferred) players through drills, he'd turn around and check the second level group here and there for "prospects". The third group was invisible to him. Never once saw him skate over to see how everyone was doing. About half way through the program, when all of the players were just freeskating around the rink before being broken into groups, one of the coaches mentioned that one little boy in the third group should probably move up -- "He's a great skater." It wasn't Duncan, no, but a little boy we see tearing it up at public skate on a regular basis. This kid is AMAZING on skates. Six years old, lightning fast frontwards and backwards, smooth crossovers, and can stop on a dime. Effortlessly. I'm not ashamed to say he could outskate me. He could outskate the coach -- he's really good. His weakness, though, is the hockey stick -- which I noticed very quickly during the first session. He treats the stick as an annoying accessory rather than as a tool for playing the game. His dad, who doesn't skate (or speak a lot of English), sent him out there with a stick with the wrong curve. That might be part of the problem but one thing is very clear, his dad knows his son has a gift and beams with pride because of it. So, yes, he's a terrible hockey player but if he ever does figure out how to use a stick, he'll be unstoppable because he's already faster than most Division 1 hockey players. How the "coach" could miss this -- and brush off an assistant coach pointing out the obvious -- is unfathomable. They're skating drills...and the best skater on the ice is standing in line watching a wobbly teenager gingerly tip-toe around orange cones. So while I think the intentions of this program are good, the execution left a lot to be desired.